On a recent visit with my mom she pulled out some baby cashmere yarn. I couldn’t find it in my heart to say no to such a fine offer. 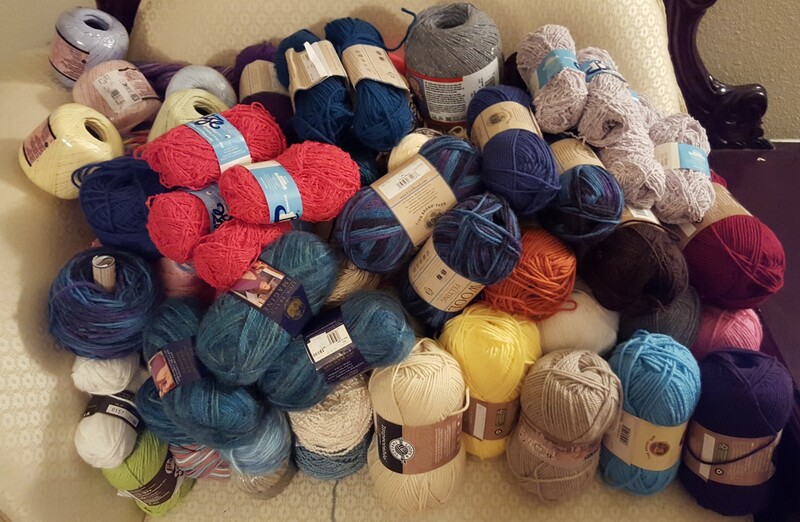 So, I brought the yarn home with the express idea that I would start on a project right away. At first I thought I was going to make a whole set of items to wear. I thought about making a scarf or cowl and a hat and maybe some gloves, if there was enough left over. But when I was talking to friend about how we both have this really big curly hair that hats just don’t really work with she mentioned that she wanted to make a hood and then I thought about some hooded scarf patterns that I had seen. Eventually I came across a pattern for a hooded shawl and I had to try it since I had the exact right amount of yarn. Unfortunately, not all things go well. I already know I’m going to have to make some adjustments to the pattern after finding out that the Mulled Grape color was from a bad lot. There were several breaks and tears in the yarn making it very hard to work with. Which basically means that I’m not going to have enough of one of the colors to actually do the shawl the way it’s meant to be done. I’m pretty sure I’ll be cutting out the last alternating section. The one really nice thing is that because this is such a simple pattern it is very quick to knit up. So after I add the hood I may try and see if I can stretch out my yarn to finish the rest of the shawl, and if I can’t, I won’t have spent too much time trying it. For now I’m going to knit to the end of the next large lavender block and then start working on the hood with placement on the side. I’m guessing that’ll I’ll end the shawl with an I-cord of the mulled grape after the last lavender block. It’ll only make the shawl 10 rows short along the top edge (but 20 total rows of the pattern since the edge stitches are slipped at the end of a row), which should be fine since most of the images I’ve looked at show the hood spanning from the first alternating section to the beginning of the third large block, which is what I’ve knitted so far.